Giles Milton always tells a good story and The Riddle and The Knight is no exception. 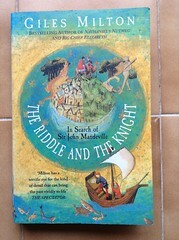 Part travelogue, part history, part biography, The Riddle and The Knight explores the life and times of medieval traveller (two of my loves combined!) Sir John de Mandeville, who spent 34 years on an extended pilgrimage tour of the near east and beyond, and wrote them up in The Travels of Sir John Mandeville on his return. His account became a Medieval best seller. In it he claimed to have circumnavigated the globe. But, having finished the book relaxing on the sofa at 40A as the rain tipped down outside, I really, REALLY want to know how his wife spent those 34 years. P.S. I also like the fact the Sir John was liege man to Sir Humphrey de Bohun, Earl of Hereford and Essex. Those two counties loom large in this Loosemore’s life!